Project H-CAMS370-S12 - Black Knight Guild Prod. "But even a dead god can dream. A god — a real god — is a verb. Not some old man with magic powers. It's a force. It warps reality just by being there. It doesn't have to want to. It doesn't have to think about it. It just does." 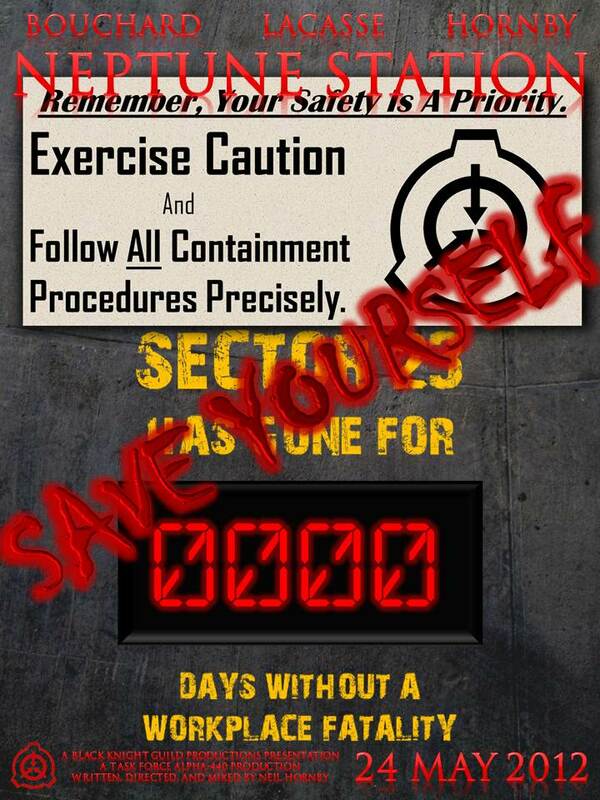 Clandestine and worldwide, the SCP Foundation operates beyond jurisdiction, empowered and entrusted by every major world government with the task of containing ‘items which jeopardize normalcy.’ While the rest of mankind dwell in the light, we must stand in the darkness to combat it, contain it, and shield it from the public, so that others may live in a sane, normal world. We secure. We contain. We protect. Plot Summary: The SCP Foundation, a clandestine global organization tasked with securing, containing, and protecting ‘items which jeopardize normality’, discovered an object buried in the silt at the bottom of the Scotia Sea. Within and around this object, spacetime is warped and the laws of physics do not behave as expected. While the scientists studying the object believe it to be a find on par with the invention of the wheel or the mastering of fire, the project has hit a snag: the research outpost, Neptune Station, has ceased all communications with the outside world. A team, Mobile Task Force Omega-4, must determine what went wrong, before they too fall victim to the dangerous posed by the object. The SCP Foundation, a clandestine global organization tasked with securing, containing, and protecting ‘items which jeopardize normality’, discovered an object buried in the silt at the bottom of the Scotia Sea. Within and around this object, spacetime is warped and the laws of physics do not behave as expected. While the scientists studying the object believe it to be a find on par with the invention of the wheel or the mastering of fire, the project has hit a snag: the research outpost, Neptune Station, has ceased all communications with the outside world. A team, Mobile Task Force Omega-4, must determine what went wrong, before they too fall victim to the dangerous posed by the object. Omega-4 docks with Neptune Station to find it running on emergency power and apparently abandoned. They travel to the CIC, where they discover the station’s director, surrounded by the dead bodies of the rest of the command staff, shell-shocked and repeating the same damage control procedure over and over. Omega-4’s technical expert determines that there is a bomb in the object, which they must disarm lest it tears a hole in the fabric of spacetime. Leaving the director to affect repairs, they enter the object to disable the bomb. Along the way, Omega-4 encounters a series of psychologically shattered individuals and bizarre horrors. First they find the station’s head of research, Dr. Kelly, whose memory was wiped clean. Then, they find a researcher slamming his fists against a column while insisting he sees ghosts. Third, they encounter a team of scientists trapped in a time dilation field. The director contacts Omega-4 to tell them another team from the station is about to meet them, and that they should all leave the object, since a lot of monsters are headed their way. The director tries to shut down the bomb remotely, but this results in the station’s computer going crazy, causing the director’s death. A firefight ensues with the monsters, which, as it turns out were at one point the station’s crew. Omega-4 helps Seventeen, a D-class (former Death Row convict recruited to help with experiments), down from the ceiling, where she was trapped after the gravity inverted. They arrive at the central chamber of the object, where the bomb is located. One of the surviving station engineers disables the bomb. Dr. Kelly thanks him, then promptly kills him and one of the guards, revealing herself to be the cause of all the strange things which had happened. Whether she (Dr. Kelly) is speaking or the object is speaking through her is unclear. Omega-4 and Seventeen manage to kill Kelly, but Seventeen is mortally wounded. The team then flees the object and escapes the station in a minisub. After the credits, it is revealed that despite the now obvious and significant dangers of the object, the station will be rebuilt and research will continue. This audio drama follows the structural conventions of an hour long television show: five acts running approximately 44 minutes. It focuses on three main characters: Lieutenant Commander Marks, the British leader of MTF Omega-4; Chief Petty Officer Brandt, the American demolitions expert of Omega-4; and Dr. Rex, the American technical expert of Omega-4. The science and military aspects of the story have been thoroughly researched, so the breaks from reality are deliberate and considered, rather than accidental. The work fits in with the mythos of the SCP Foundation online creative writing community, keeping with the style and tone of the existent works found on the wiki. Most noteworthy is the gradual increase in tension and jeopardy, utilizing the maxim “nothing is scarier” to allow the audience to imagine the horrors before “showing” them through sound. The project will follow the patterns of traditional radio theatre, depending on dialogue and SFX to tell the story, rather than visual imagery. While this results in some breaks from reality, such as dialogue as exposition, these parts of the medium are necessary and traditional. This work is intended for casual entertainment. In the most general sense, the intended audience consists of fans of science fiction horror. More specifically, it is intended for the fans of the SCP Foundation mythos, though it is also intended to stand alone without a priori knowledge of that fictional universe. Like many works in the mythos and genre, this project intersperses black humor into the horror, momentarily relieving the tension so it may continue building over the entire work. This work will be released on the internet through the SCP Foundation creative writing wiki located at http://scp-wiki.wikidot.com/. This community maintains a high standard of work through a voting system. Works posted to the site are given a rating, equal to the net score of positive votes (“upvotes”) minus negative votes (“downvotes”). Each member of the community is permitted a single vote. If a work reaches a rating of -5 or lower, the site’s senior staff vote on deletion, needing four votes for deletion to remove the work. This process is egalitarian and maintains very high standards, but is also very harsh and unforgiving. Additionally, though there is some consensus among members that audio dramas are an intriguing idea for SCP Foundation work, the medium has not yet hit a full stride with only a couple such works existing on the site. Accordingly, this work will also be disseminated through my own site for audio productions, http://blackknightguild.wikidot.com/. There it will not be deleted by the whims of the SCP Foundation community. It is possible that this work might be broadcast over KRLX; I have not yet made inquiries with various show hosts and station management to find an appropriate timeslot. If there is a class exhibition, I will ask to be part of that. Otherwise, I will host a local exhibition of the project, reserving a room with a good sound system. Again, there may be a broadcast of this work over KRLX; this would not replace the above, serving simply as a supplemental exhibition. Recordings forwarded to Mixing Engineer? N/A; Hornby is both the recording and mixing engineer. Mixing Engineer has received all necessary raw parts? Rough mix created (no music yet)? Done. Mix approved by director and producer? Done. Music added into mix? In Progress. Levels altered to account for music? In Progress. Tentative final mix approved by director and producer? Final cut reviewed for content? Final cut reviewed for technical aspects? Final approval of end product by director and producer? End product posted to main site? Sector 23 Submarine Research Station for Project Daedalus - informally "Neptune Station"
Unless noted, spelling, pronunciation, and use of names has been confirmed. A tab for brainstorming by the production staff of this project. This tab includes the basic story of the production; it is not the script, but rather what the script is written from. Production Script. File current as of time and date at top of each page.